Chicago Elects First Black Female Mayor: Lori Lightfoot Lori Lightfoot, former head of a police oversight board, will also be the city's first openly gay mayor. She campaigned as being independent in a city known for its political machine. 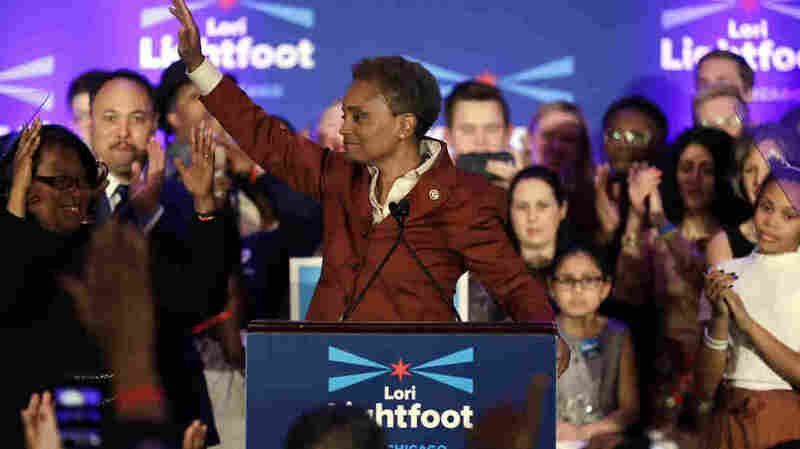 Lori Lightfoot waves to supporters at her election night party in Chicago on Tuesday. Lightfoot — a former federal prosecutor who has worked in police oversight — easily defeated Cook County Board President and county Democratic Party leader Toni Preckwinkle. With 98 percent of precincts reporting, Lightfoot had won 74 percent of the vote, according to the Chicago Board of Election Commissioners. "Thank you, Chicago. From the bottom of my heart, thank you," a beaming Lightfoot told her supporters in a speech punctuated by fist pumps and waves to the crowd. "In this election, Toni and I were competitors, but our differences were nothing compared to what we can achieve together. Now that it's over, I know we'll work together for the city we both love," she said. "Today, you did more than make history. You created a movement for change." Regardless of who won, the nation's third most populous city would get its first black female mayor. Lightfoot also becomes the city's first openly gay mayor. The free-for-all campaign represented a sharp contrast to almost every past election in a city that has been synonymous with Democratic machine politics and bossism for nearly a century. 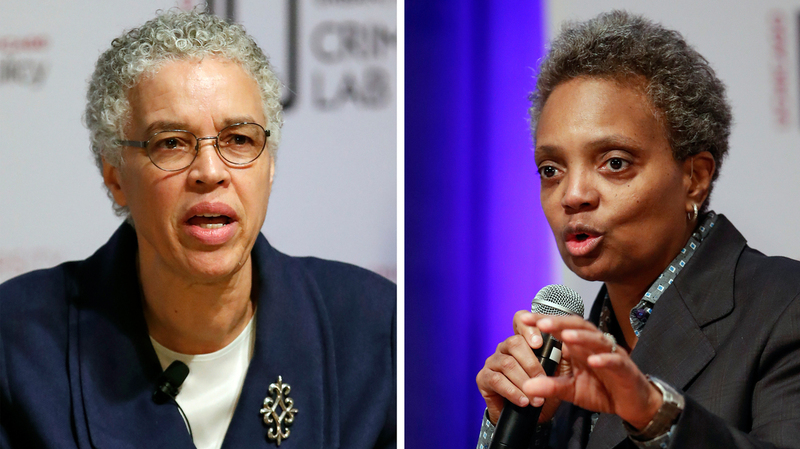 Chicago mayoral candidates Lori Lightfoot (right), who won the election on Tuesday, and Toni Preckwinkle speak during a March 13 forum on crime and violence. In the first-round election in February, Lightfoot, 56, and Preckwinkle, 72, were the top two vote-getters among 14 candidates. Lightfoot led the crowded field with 17.5 percent of the vote, while Preckwinkle received about 16 percent, qualifying them for Tuesday's runoff election. The wide-open succession battle began with a surprise retirement announcement last year from two-term Mayor Emanuel, a prolific fundraiser and former White House chief of staff to then-President Barack Obama. The famously combative and profane Emanuel had earlier said he planned to run for a third four-year term. But Emanuel's popularity suffered major blows as he grappled with the city's deep financial crisis and the increasingly volatile relationship between police and the black community. Those tensions rose dramatically after the 2015 release of a videotape showing a white officer firing 16 shots into Laquan McDonald, killing the 17-year-old African-American. Both Lightfoot and Preckwinkle sought to brand themselves as much more progressive Democrats than Emanuel, a centrist who often feuded with public-employee labor groups, including the teachers union. After recent polls gave Lightfoot a big lead, many Emanuel backers in the city's business community gravitated toward her. In her first campaign for public office, Lightfoot argued that she's the best candidate to "break from the status quo that has failed us" and deliver "equity, inclusion and fairness." The only way we are going to carve a new path for the city ... is to vote for change. "It's unacceptable, the condition of our communities on the South and West sides," she said during a candidate forum last week on WBEZ-Chicago Public Media, referring to predominantly black and disadvantaged areas of the city of 2.7 million people. "The only way we are going to carve a new path for the city, to take us in a direction that our communities don't continue to be resource starved, is to vote for change." In January, federal prosecutors alleged attempted extortion by veteran City Council member Edward Burke. And they accused Burke of shaking down a businessman to give a campaign contribution to Preckwinkle, who is also leader of the Cook County Democratic Party. Preckwinkle also warned that Lightfoot's thin political resume shows she would be far too inexperienced for the daunting job. "It's easy to talk about change," said Preckwinkle, who once served as a member of the City Council, representing the ward where Obama lived. "Change is not easy. It takes hard work. It takes experience. Being mayor is not an entry-level job."